Unlike most of the other Doctors currently on audio, the Fourth Doctor is usually voted the most popular classic Doctor and is possibly the most popular period. 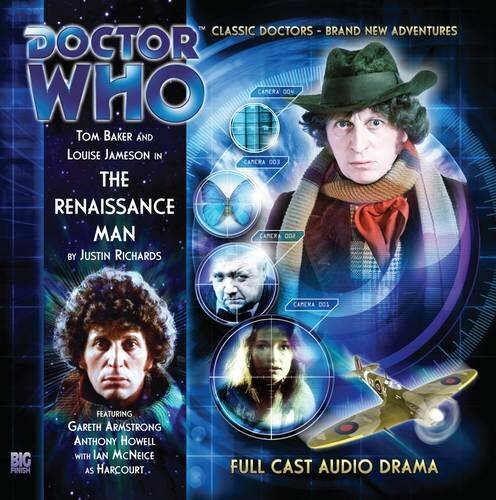 So, it was a big deal when Tom Baker finally reprised the character last year with The Fourth Doctor Adventures. I'm not covering the whole season right now, but I do want to cover a few episodes. All the episodes feature Leela, the 'savage' jungle girl companion. They also don't require anything other than a basic knowledge of the Fourth Doctor and his companion. This series us set right after season 14 of classic Doctor Who. The Doctor and Leela pick up a distress signal that leads them to a house where a group of redcoats have slain some aliens and made off with their space ship. When the Doctor and Leela try to follow, they end up en route to space dock Nerva. I just finished watching some Fourth Doctor episodes, so both Tom and Louise do sound a bit older, but I stopped really noticing after about ten minutes. 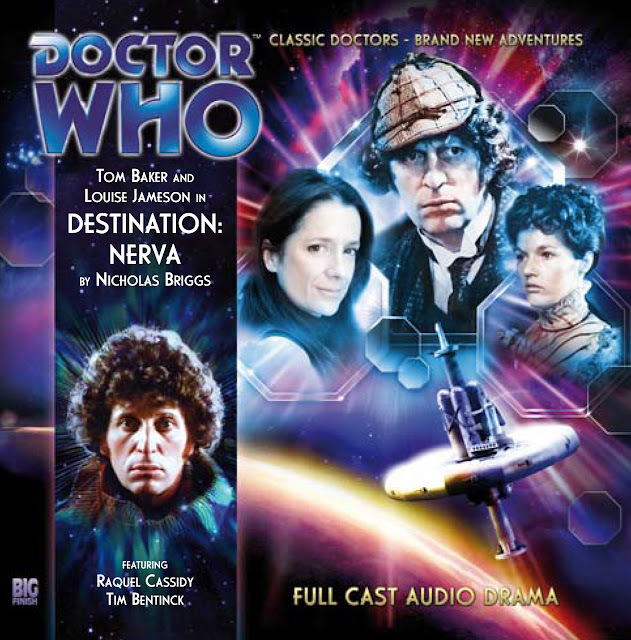 This episode focuses back on a place that the Fourth Doctor visited twice in the original series: space station Nerva. Unfortunately it is a somewhat weaker carbon copy of the Arc in Space though it does have a few things that let it stand on its own. The Fourth Doctor is entertaining but he seems a bit reserved in this outing. He gets to cut loose more in the next audio. Leela also has some good stuff. Yet again, it isn't anything really outstanding. Dr. Allison Foster is instatnly likeable as the ships medical doctor. We meet her as she complains about some defects at her job, but tries to help anyway. I really like the role she played even though it was a bit limited. Lord Jack starts off as a creepy off-kilter foe, but rapidly degenerates into the weakest part of the story. This villain is similar to the Wirrn, but less intimidating. The Drellerans are a mysterious alien species who appear in a very limited capacity in this audio. They were an interesting race who'd be cool to see in a future audio. This episode starts of with a seemingly unrelated bit before launching into the Nerva section. Both stories collide at the end, but it drags and gets a bit confused in the middle. The end was the best part of this audio and made me really wish that the start had built up to it. I really like the beginning and the end. Sadly, the middle just falls into being typical. It does have some interesting imperialist points, but I don't think they were integrated as well as they should have been. There is a good plot in this which is probably the most frustrating thing. The dual story and commonalities with previous episodes force this down to an average story. It does provide a great hook at the end that launches the rest of the series nicely. However, if you want to skip this one and go straight to next, it might leave you with a better impression of the series. The Doctor and Leela head to a museum to continue her education, but once there they discover new sections just appearing out of thin air. They are then shocked when a woman they've just met commits suicide. This is one of the rare stories with a complicated plot that doesn't devolve into strange unexpectedness. It has plenty of focus on the Fourth Doctor and Leela. It also provides a challenging foe for the Fourth Doctor to contend with. The Fourth Doctor gets in some great quips. This episode not only focuses more on the humorous and crazy sides of the Doctor, but has a lot of fun doing it. Leela continues her education with the Doctor that is the theme of this 'season.' Her strengths are brought up and examined in better detail than they were on her TV series run. The focus on what Leela can do rather than what she can't is a brilliant change of pace for the usual Doctor smart, Leela dumb dynamic. The titular Renaissance Man is our villain and is a very fascinating one at that. He is definitely more concept than character, but he provides a good opponent for the Doctor, which is hard to find. The atmosphere is a little difficult to talk about since it somewhat overlaps with the main plot. It comes across as fresh and manages to keep you oriented even through several scenery changes and some chaos. The end is pretty strange, though not much more could be expected from the story. It is a humorous yet sad result from a unique and interesting concept. This story's strangeness perfectly meshes with the Fourth Doctor's own brand of bizarre allowing Tom Baker to really shine in his role. Leela remains incredibly feisty, but capable and adds her own humor to the piece. The supporting cast was great with the villain being truly wily. This is the Fourth Doctor at his best. The Fourth Doctor continues his education of Leela when they wind up on the ancient planes of Norfolk. They encounter two soldiers accosting a woman. Leela dives in despite the Doctor's warnings. Now, not only could they change the future of mankind, but they could die in the process. This is one of the rare Doctor Who historicals. At the start of Doctor Who it was torn between exploring scientific concepts and exploring history. Gradually the series drifted away from both, but once in awhile it returns to its roots. A historical is where the Doctor, the TARDIS and his companions are the only science fiction elements. This one explores the possible consequences of acting before you know the full situation. The Fourth Doctor is at his most sage and world weary. As always Tom Baker brings a nice blend of wisdom and kookiness. The Fourth Doctor can be somewhat dismissive of Leela and that shows in this, but it comes around to teach both Leela and the Doctor a lesson. Leela's views are challenged by the corrupt and powerful Boudica. Leela's must overcome her own trustworthiness and become more critical. This is an odd message, but the story manages to make it a very effective tale. 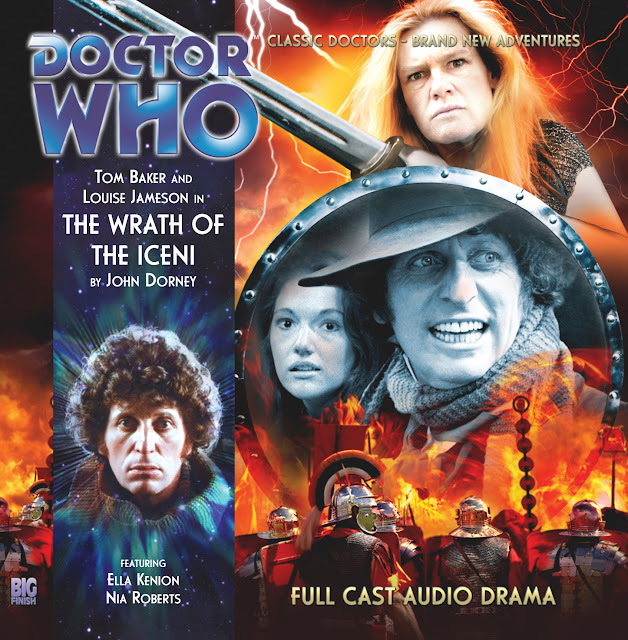 Bragnar is one of the Iceni forces who quickly learns the doctor's plans. She becomes a psuedo companion later in the piece and complements the Fourth Doctor wonderfully. Caedmon is Boudica's second in command. He is a well constructed and understated henchman. Unlike most overbearing jerk henchmen, he is just doing his job and comes off as a simple unlikeable creep. Boudica starts off as a downtrodden and betrayed woman with a heartbreaking story. Over the course of the audio she shows more of how past abuse has twisted her. The fact that her story is part of history makes it all the more fascinating and disturbing. The ending is sober yet satisfying. It's great to learn about lesser known portions of history. This story rails against letting your emotions get the better of you, but it goes far beyond that. The audio allows the very real human cost to weigh on the characters. There is also the impressive use pf tiny cast of characters. The fact that this audio manages to be amazing and really focus on the story and characters. All fans of Doctor Who should listen to this one.